If you are a big family wanting to save money, meal planning is the place to start. Large family meal planning at my house includes slow cooker meals, stove top dinners, freezer meals and even utilizing the Instant Pot. I prefer weekly meal planning. Doing more than one week at a time overwhelms me, so one week at at is what I have done for ten years now. Here are the recipes we’re making this week. 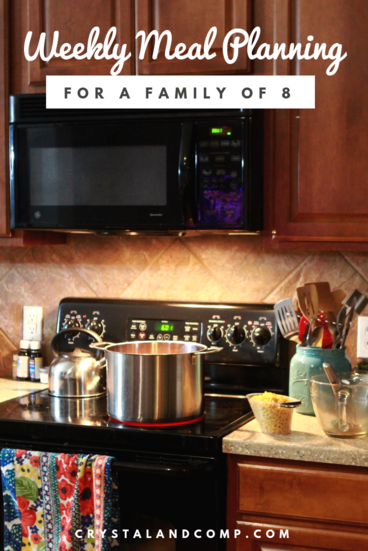 They are all great ideas for any size family, but especially a large family! What I have found works best for me is to make a list of the meals I am going to make for the week. Each night I decide what I want to make tomorrow for dinner- we don’t go in order. You will notice I don’t assign a day of the week to any of my meals. The night before I lay out whatever needs to be defrosted from the freezer to make tomorrow nights meal. Chicken and Dumplins– I used shredded cooked chicken that I batch cooked last Friday and froze into 2 cup portions. This made making dinner this particular night, super easy!! The recipe I linked to for the chicken and dumplins is one I follow as a base. I add milk with my broth I don’t use boxed broth. The dumplins are spot on. Such a tasty recipe. My boys like to eat this with crackers. So good!! Chicken Noodle Casserole– this is a freezer meal I only have to defrsost and pop in the oven. You can get the recipe in our December freezer meal pack. The recipe uses up leftover turkey that you may have from Thanksgiving or Christmas, but I just used chicken. I will serve this with our favorite Sister Schubert’s rolls. We love them!! 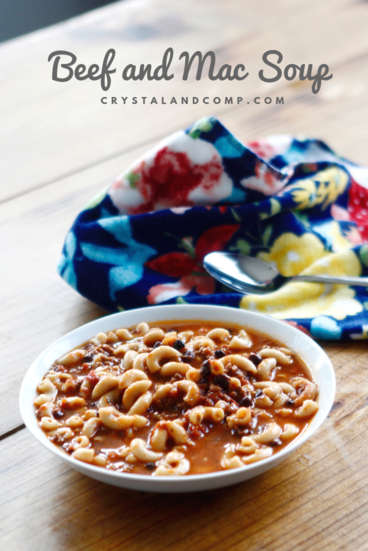 Beef and Macaronni Soup– this is a freezer meal from December as well. So delicious! I added 2 cans of black beans to stretch the meal out and to thicken it up at bit. Serve it with tex mex cornbread or sweet cornbread. Eat the leftovers for lunch! Zucchini Lasagna– I saw a friend on FB post about making this the other day. It looked so good and I had been wanting to try it for a long time as my SIL has talked about making lasagna this way many times. I am going to use ground Italian sausage, but you can use ground turkey or chicken for a lighter version. Serving this with salad and garlic bread. Taco Night– because it’s easy! Especially when you have precooked beef in the freezer. Leftover Buffet– use em up! If you like some of the recipes I shared above but want other options, here are a few to consider. If you love having a weekly taco night, but you like to switch things up a little bit, here are a few alternatives: Slow Cooker Lentil Tacos or Creamy Chicken Soft Tacos. If you want to make lasagna but you need it to cook fast, try Lasagna Roll Ups. They are so easy to make and cook super fast! If you love chicken noodles recipes and they feel like comfort food to you, we have a list of twenty five different ideas. 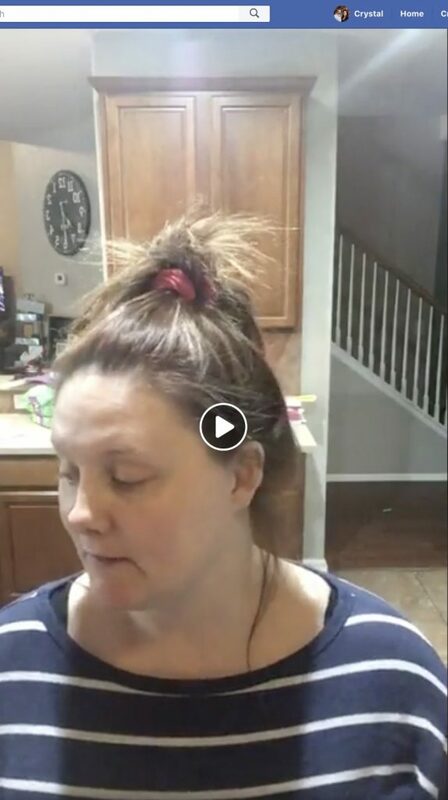 Last Friday I did a FB live showing how I batch cook 10 pounds of ground beef and how to make two large rotisserie chickens at home in the slow cooker so you can have 8-10 coups of cooked chicken in your freezer. You can watch the video here and cook along with me to fill your freezer and make weeknight dinners easier. To watch the video you will need to join our group, Get Dinner on the Table. We will approve you ASAP. In the group we share recipes, live cooking videos, helpful tips and solutions to help moms get dinner on the table. If you need accountability, encouragement, recipes ideas or tips for making dinner time easier, it really is a great group to join. I am a real mom with six kids still at home. My videos are not professionally shot with full hair and makeup done. I am real. If you are on a tight budget and needing to streamline spending, your grocery budget is the very first place to look. For me what keeps me on budget, prevents me from impulse shopping and helps me know what I am spending every time I add something to the cart without carrying a calculator around with me, is online grocery shopping. I have been using Walmart Grocery pickup for two years now. Below is my video of my last grocery pickup so you can see what that process looks like. Again, real life. Messy car. No makeup. You get it. Do you have an electric pressure cooker and want to utilize it to get dinner on the table fast? We love using our InstantPot. For years I’ve used the 6 quart but just recently ordered the 8qt for our large family of eight. 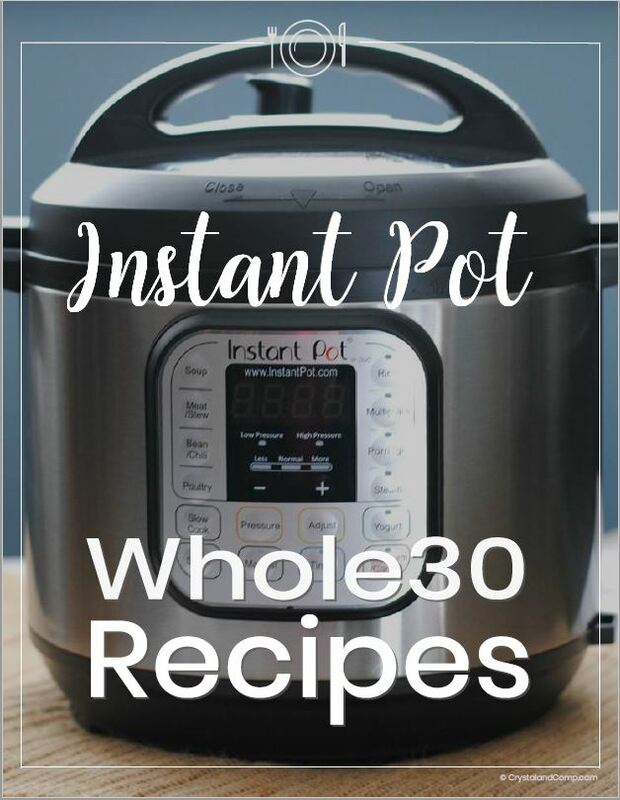 If you are looking for some delicious recipes to get healthy recipes on the table for your family you should try these twenty-two Whole 30 InstantPot Recipes. This instant download will help you get dinner on the table fast! I too plan week to week and don’t necessarily assign a set day (unless we have something going on that day!). Today we were at a painting class all afternoon so I know I wanted a crock pot meal. This week we’ve had/ will have 1. a whole chicken in the crock pot with green beans and potatoes (and leftover chicken will make 2. a chicken pot pie this weekend), we’ve had 3. homemade Chinese food, tacos,4. steak broccoli, egg noodles and salad (a special request as a birthday dinner) 5. turkey noodle casserole (still working on using up Thanksgiving leftovers! ), 6. Ham and pea mac and cheese (using up some of our New Year’s leftovers), 7. hamburgers and hot dogs with salad. Thanks so much for sharing with us at the Encouraging Hearts and Home party. I love seeing other people’s meal plans! I’m always on the lookout for a new recipe my boys would be willing to try. Pinned. Your chicken and dumplings recipe looks delicious. It’s cold and snowy in my part of the world, this is a perfect cold weather meal. Thanks for sharing on Sunday’s Best.